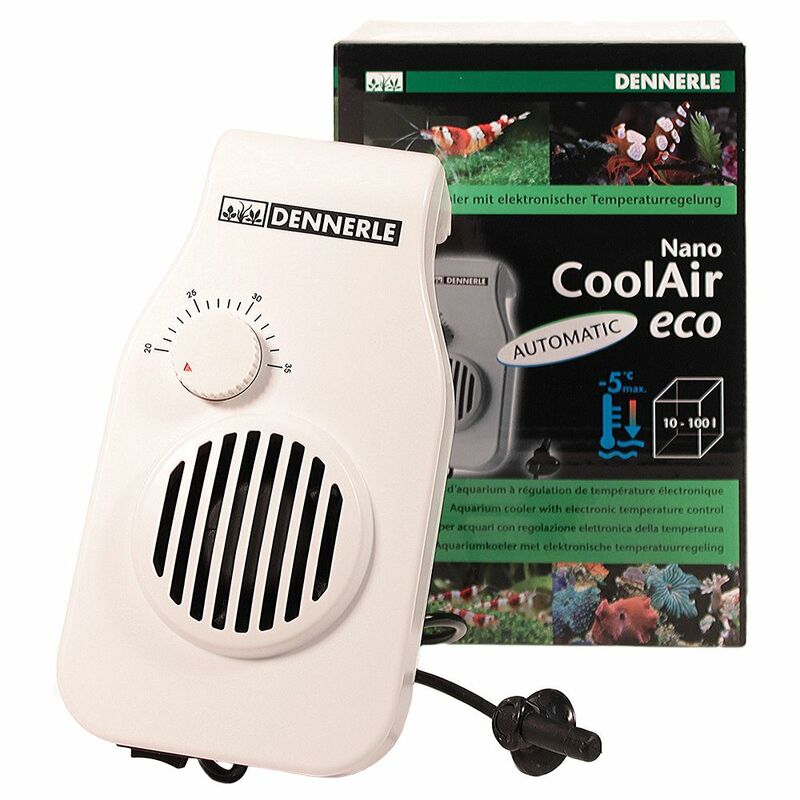 The Dennerle Nano CoolAir eco reduces the water temperature of your aquarium by 2 to 5 degrees;C. This water cooler uses the principle of "evaporative cooling", which arises when air moves over a moist surface. The cooler attaches to the outside of the aquarium and turns on only when it is needed, which makes it energy efficient and safe to use. The water temperature of an aquarium is one of the most important factors in maintaining a suitable environment for your fish. The Dennerle Nano CoolAir eco helps control the temperature of the water effectively, preventing it from getting too warm for your fish. The cooler operates on 12V and attaches to the outside of the aquarium, making it safe and easy to use. It constantly measures the temperature of the water and will automatically turn on once the water reaches a pre-set maximum temperature. Using the evaporation principle, air is blown directly over the surface of the water, helping it cool. The temperature of the water can be reduced by 2 to 5 degrees;C, depending on the size of the aquarium and is suitable for aquariums between 10 - 100 litres. The Dennerle Nano CoolAir eco only switches on when it is needed and will automatically turn off once the water temperature is cool enough. This not only helps save electricity but also prevents the unneceΒary evaporation of water from your aquarium. The aquarium cooler has two adjustable power levels, full and half power, giving you more control over the water temperature. Dennerle Nano CoolAir eco at a glance: Electronic aquarium cooler for marine and freshwater aquariums (10 - 100 litres) Cools water using the evaporation principle Switches on and automatically cools water when it exceeds the set maximum temperature Cools water between 2-5 degrees;C Attaches to the outside of the aquarium 2 adjustable power levels: Full Power and Half Power Energy saving: automatically turns on only when needed, prevents uneceΒary water evaporation Power: 25 watts Voltage: 12V safety voltage Maximum air flow:385 l/min or 23. 1 m³/hr Dimensions: 8.7 x 8.5 x 16.2 (L x W x H) Please note: This device is designed for use in Germany and thus comes with a power adapter for use in the UK.